I have been taking 100mg of Danazol, maybe twice a week, for hormonal breast pain, the pain is not intense now but more of an inconvienence. I have not dived since taking the Danazol, because the opportunity has not arose. I also now have to start taking Lariam, due to a 6 month posting to Kenya. I now have 2 questions. 1. Can I take both Danazol and Lariam at the same time? (The pharmacist wasn't too sure, she is going to let me know). If this is not possible I will stop taking the Danazol. 2. My next question is obvious - can I dive whilst taking these tablets? Mombassa etc!!!! ( I have taken Lariam on previous occassions with no obvious side effects). Good news all round for you. Yes there is no problem in taking Danazol with lariam, the 2 drugs work completely independently of each other and so there is no synergistic effect that will cause you to explode or break out into weird rahes. There is also no problem with diving and Danazol, and you may find it even helps protect you from a bend. The reason being that there is a link between a hit and having a period, and as Danazol will also cause the cessation of menstrual bleeding then it may oddly make it a tad safer on a dive. The deal with lariam is different. I hope you all know that this is not my preferred anti-malarial to dive with. It does have too many side effects that could either cause a panic underwater or be mistaken for a bend. However I suggest this to the uninitiated. Those who have taken lariam and have absolutely no problem with it will be OK to dive on it as of course there are those ho are fine with this medication. Malarone is the alternative but it is a daily tablet and for 6 months the cost can really add up. So unless you have just won the lottery stay as you are. I always read your "Medical Solutions" section in Sport Diver and wonder if you can help me with the following. I am approaching 50yrs and for several months have been getting menopausal symptoms. Before I go to my local GP to discuss HRT, please can you advise me if any of the HRT preparations are "banned drugs" as far as diving is concerned. I would rather put up with the menopausal symptoms than have to stop diving. And what a fantastic advertisement for diving that is. The joys of the deep exchanged for 5 years of the misery of anger, night sweats, facail flushing and a dry you know where. Your husband might not be so pleased when you take a chainsaw to his neck for leaving the loo seat up. Overreact..me you will say to the judge! Well all will be just fine in life. HRT is fine to dive with. Just make darn sure you are given the right one. Take the tablets not the patches. The latter tend to float off your arm underwater. And who knows what can happen to them. I would hate to see how an Oceanic White-tip behaves when crammed full of oestrogen. 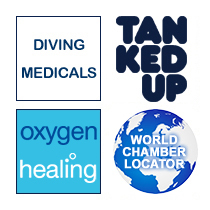 And finally if anyone has a medical problem related to diving I am always really happy to help out. However it's easier in this busy day and age if you e-mail it to me rather than call the number. There is an exception though. If it's a bend you get straight through to the doctor. And remember all treatment in the UK is on the NHS, so don't be afraid to call. My doctor has just put me on a tablet called Cyclokapron for period pains and heavy bleeding. I have to take it during my periods once a month. The question is, as a dive instructor, is it OK to dive and take this medication or should I just put up with the pains so as to make sure I'm not going to increase my chances of getting DCS. This is one of the in-vogue treatments for your problem. Cyclokapron is also known as tranexamic acid and it is useful in period pains as it is an "antifibrinolytic". This means that it prevents the substance that breaks down blood clots, which basically means that you bleed less each period. Now there's little evidence to suggest that this medication will cause any problems for you when you dive, and it may well even help you to dive more healthily. By this I mean that there is a link between getting the bends and having your period at the time, but again the evidence is being slowly researched as to exactly why this is the case. But there may well be a function of the blood loss involved and if this tablet can decrease your blood loss during a period then it may mean it is a tiny bit safer than not taking it in your condition. Again, watch this space as more women dive we are always finding out more of the conditions of female physiology and the effects of hyperbaric exposure and I will keep you informed of any developments. To delay my period on my diving holiday to the Red Sea in March I am going to take NORETHISTERONE twice a day. Just really wanted to check this would be safe and not increase the risk of DCS? Ladies wonder drug, that. Fed up with periods-worried about sharks- can’t buy “you know what” up the jungle. Never fear norethisterone is here. It’s basically a hormonal analogue that makes your pituitary-ovary-uterus axis think: “Hmm, not time for my period yet, let’s delay for a while”. And so to contradict that awful 70’s chanseur with “Only women bleed”- you don’t. Not at all. Only when you stop taking them. So this is a widely used drug by those on honeymoon, models on photo-shoots and yes, divers. The rules are simple. You take the drug each day, start a few days before you expect your period, and as long as you take it the period will not come. It will though, a day or so after you stop. The max time you can take it for is to block 2 periods, so that is 2 months, but most ladies will do a couple of weeks whilst away. Side effects….a little fluid retention [no bad thing with diving] and maybe a feeling of uterine fullness. All should be well, no DCS risk. And don’t worry about the shark gag, they prefer surfers and cameramen. It’s the bull seals that like the laydeez.